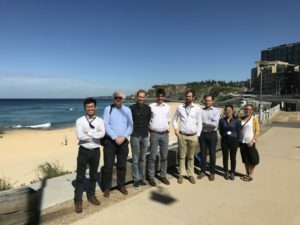 Members of the OFFshore Hub recently made a splash at the 34th International Workshop on Water Waves and Floating Bodies (IWWWFB) in Newcastle, New South Wales – the first time this prestigious workshop has been held in Australia. Chief Investigators Paul Taylor, Wenhua Zhao and Hugh Wolgamot, and Research Fellows Lifen Chen and Ian Milne, were in attendance along with numerous other colleagues from UWA. The annual meeting brings together engineers and scientists with a particular interest in water waves and their effects on floating and submerged bodies. Emphasis is placed on the participation of younger researchers, interdisciplinary discussion between engineers and scientists, and the presentation of preliminary work prior to publication. Participants will include marine hydrodynamicists, naval architects, offshore and arctic engineers and other scientists and mathematicians, who will discuss current research and practical problems. OFFshore Hub members presented their work on a variety of topics including: Gap resonance driven by linear, quadratic and cubic wave excitation, Wave interaction with a shallowly submerged step, Nonlinear wave diffraction and radiation around a ship-shaped FPSO in oblique seas, and Experiments on a barge rolling next to a wall. The workshop provides an open forum for both exchanging and collating knowledge. It’s proceedings are freely available here where contributions can be found dating back to the workshop’s inception in 1986.